Produktinformationen "This is Korea - All you ever wanted"
Though there are many books that introduce Korea to foreigners, not many people really know Korea and even less, the Korean people. In many ways, Korea is overshadowed by its two neighbors in size by China in economy by Japan and therefore relatively unknown. So, this book looks at Korea through the perspective of foreigner and gives the reader a true understanding of Korean psyche with the various contents, from the basic facts about Korea to the sections detailing Korean culture and its routine. Also, It explains Korea in a reader friendly way, if your Korean friend were explaining to you what Korea is really like��warts and all! It would be an ideal gift for both the traveler and the working expat in this country. Plus, for anybody who wants to know about TRUE Korea. CHOI Jung-wha Professor at the Graduate School of Interpretation and Translation, Hankuk University of Foreign Studies in Korea, she was the first Korean to receive a conference interpretation diploma(Korean, French, English). Currently as president of the Corea Image Communication Institute, she manages the Korea CQ forum which aims to promote a positive image of Korea. She is also a member of the National Image Promotion Board. She received major awards including the Palme Academique and Legion d'Honneur from the French government for her contribution to education, communication and cultural exchange as well as the Prix Danica Seleskovitch from Association of Danica. She also authored numerous books including Interpretation, Translation and Foreign Languages, Dare to Become an Interpreter, Teaching Foreign Languages to Children, English Expressions Most Misunderstood by Koreans. LIM Hyang-ok Currently professor at the Graduate School of Interpretation and Translation, Hankuk University of Foreign Studies in Korea, she also has interpreted for innumerable conferences including summit meetings such as APEC, ASEAN+3 and UN General Assembly meetings. She is a member of AIIC (Association Internationale des Interpretes de Conference) since 1995. She also acts as a communications consultant providing tailor-made English communication and English language programs. She has also written English for International Conferences and Use the Right Word. 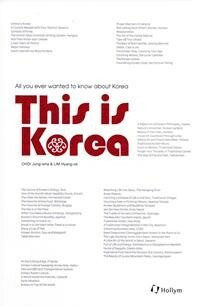 Weiterführende Links zu "This is Korea - All you ever wanted"
Unser Kommentar zu "This is Korea - All you ever wanted"
Kundenbewertungen für "This is Korea - All you ever wanted"